MIT’s President is supporting the plan, but it doesn’t take rocket scientists to understand the crisis. On July 1, if Congress does nothing between now and then, the interest rate charged on subsidized Stafford loans to college students will double from 3.4 percent to 6.8 percent. 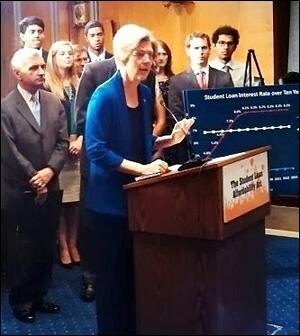 On May 8 of this year, Senator Elizabeth Warren introduced her first piece of legislation, the Bank on Students Loan Fairness Act, which would allow students to borrow at the same interest rate on their student loans from the government as big banks pay when they borrow from the Federal Reserve’s discount window – a rate currently set at .75 percent. The rate would last for one year to allow Congress to enact a long term solution. Congressman John Tierney introduced a corresponding bill in the House of Representatives. Fifteen organizations have signed on as supporters to the plan, including the American Association of University Professors, the American Federation of Teachers, the National Organization for Women and the United States Student Association. Two organizations have received over 1 million signatures on their online petitions: the Progressive Change Campaign petition has garnered 623,595 signers as of this morning while the Move On petition has collected 442,220. In announcing the plan, Warren called the rise in student debt, now over $1 trillion, “a risk to household spending” and a “threat to middle class stability” saying that together it was threatening economic recovery. Add a tepid job market for new graduates and the dangers broaden. The interest rate on federal subsidized Stafford loans is set to increase from 3.4 to 6.8 percent on July 1. If Congress does not act soon, millions of college students will see their student loan payments increase needlessly. Student loan debt is a growing crisis, and it threatens our economic recovery. Outstanding student loans now total more than $1 trillion, surpassing total credit card debt. Last month, the Federal Reserve identified this mounting debt as a risk to household spending. The burden of loans keeps borrowers from buying homes, saving for retirement, and engaging in consumption that will keep our economy on the road to recovery. Keeping interest rates low is essential. While borrowers struggle to repay their debt, the federal government is making money on its student loan programs. This year, the federal government will make $34 billion on student loans. The government even makes money on its loans to low-income students – 36 cents, on average, for every student loan dollar it puts out. If Congress allows the interest rate on these loans to double, the federal government will bring in even more revenue – money that comes straight from the pockets of college students. Some argue that it’s too expensive to keep government loans at low interest rates, but the federal government makes low-interest loans all the time – just not to everyone. Big banks can borrow money from the Federal Reserve with an interest rate of less than 1 percent. Through the Federal Reserve discount window, a bank can get a loan at a rate of about 0.75%. Sets Interest Rates for Government Loans to Students at the Same Level as Government Loans to Banks. The Act would provide a one-year fix to the impending interest rate hike by setting the rate for federal subsidized Stafford loans at the primary interest rate offered through the Federal Reserve discount window as of July 1, 2013. Funded by the Federal Reserve, Administered by the Department of Education. The Federal Reserve would make funds available to the Department of Education to make these loans. While the Federal Reserve would now provide funding, the Department of Education would continue to administer all other aspects of the federal subsidized Stafford loan program in the same manner as it currently does.